ERROR  [QODBC] QB Begin Session Failed. Error = 8004041d,80040418 This application is not allowed to log into this QuickBooks company data file automatically. The QuickBooks administrator can grant permission for automatic login through the Integrated Application preferences. Test connection to Quick Books - FAILED: "[QODBC] QB Begin Session Failed. Error = 8004041a. This application does not have permission to access this QuickBooks company data file. The QuickBooks administrator can grant access permission through the Integrated Application preferences"
I am receiving the error: “Recent changes to your configuration require you (the QuickBooks Administrator) to go into the Integrated Applications preferences and re-authorize your integrated application to log in automatically.” Immediately when starting the QODBC program. Please keep QuickBooks running, logged in as Admin to your company file, Switch to single user mode. Navigate to "Edit" Menu -> "Preferences" -> "Integrated Applications" -> "Company Preferences" Tab. Please make sure ALL the applications with the name "FLEXquarters QODBC" has "Allow Access" option CHECKED/TICKED. If it is unchecked, please check it & apply changes by clicking "OK" button. Keep QuickBooks running and in single user mode, try to connect with your application. 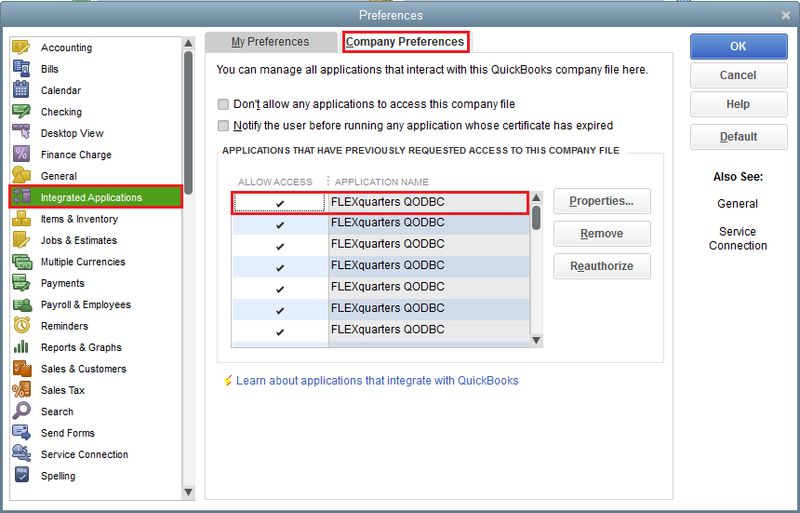 After removing all the "FLEXquarters QODBC" integrated applications, please close Integrated applications window. "QB Begin Session Failed. Error = 80040430, This application is unable to log into the Reckon Accounts company data file automatically.The Reckon Accounts administrator must grant permission for automatic login through the Integrated Application preferences. If such permission was already granted, the administrator must revoke permission, then grant the permission again"
I would like to inform you that above error says that you have not accepted QuickBooks certificate. Please keep QuickBooks running, logged in as Admin to your company file, Switch to single user mode and try to connect using your application, it should pop-up Data Access Certificate on QuickBooks, Please accept the Certificate Then try again. I kindly request you to please create new MS Access database & keep QuickBooks running, logged in as Admin to your company file, Switch to single user mode and try to connect, it should pop-up Data Access Certificate on QuickBooks, Please accept the Certificate. I would like to inform you that QuickBooks issue Certificate is for each application. You might have accepted the certificate for application A, but application B would not have access. For those who use QuickBooks 2006 and the previous version, please see: After upgrading to QuickBooks 2006, QODBC "auto-login" unattended mode no longer works? For more details on troubleshooting auto-login mode connections. This is a known problem that exists in the QuickBooks qbXML SDK from Intuit, caused by QuickBooks when upgrading an existing QuickBooks company file that had previously worked with QODBC to the new 2006 USA format (used by QuickBooks 2006 and 2007) or even adding new user accounts to QuickBooks. The problem still exists with QuickBooks 2007. This issue is an Intuit SDK issue, not QODBC. Intuit required us to change unattended mode access for QuickBooks 2005 and 2006, which we did from QODBC v6.00.00.150 onwards. Unfortunately, all 2005 company files that have been accessed previously by QODBC have this problem when the company file is converted by QuickBooks to the new 2006 or 2007 Anywhere Sybase backend format. The Intuit conversion corrupts the internal integrated applications settings, and you need to do the 17 step procedure workaround. Using the R5 (or later) release for QuickBooks Enterprise Solutions Version 8, developers can now use their QODBC applications with QuickBooks closed. 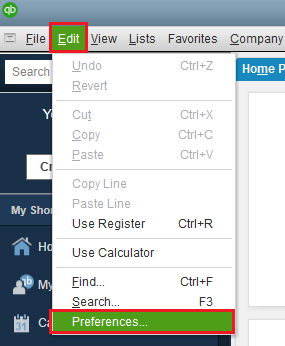 Remember that when using this feature, you have to use 'Locate a company file' or a QODBC connection string with "DFQ=C:\Program Files\QODBC Driver for QuickBooks\sample04.qbw" rather than 'Use the company file that's now open in QuickBooks'. Note: R5(or later) for QuickBooks Enterprise 8 (2008) has the Intuit bug fix, not R11(or later) for QuickBooks Enterprise 7 (2007) !!! !